URBAN REGENERATION IN THE CAPITAL! Join us for an evening of envisioning ecologically regenerative and resilient cities- and learn about many projects on the ground actualizing this vision. When it comes to ecological health and food production in today’s cities, there’s very little we might want to “sustain”. As urban populations continue to grow worldwide amidst the convergent crises of energy depletion, climate change, and economic ‘uncertainty’, its critical we redesign our cities to provide for more of their residents’ needs. This workshop focuses on practical skills usable by communities in cities and elsewhere to achieve greater local access to and control over life’s essential resources. We’ll discuss simple and affordable techniques for soil building, bioremediation, rainwater harvesting, intensive food production, micro-livestock and aquaculture, small scale autonomous energy production, and other infrastructure retrofit. 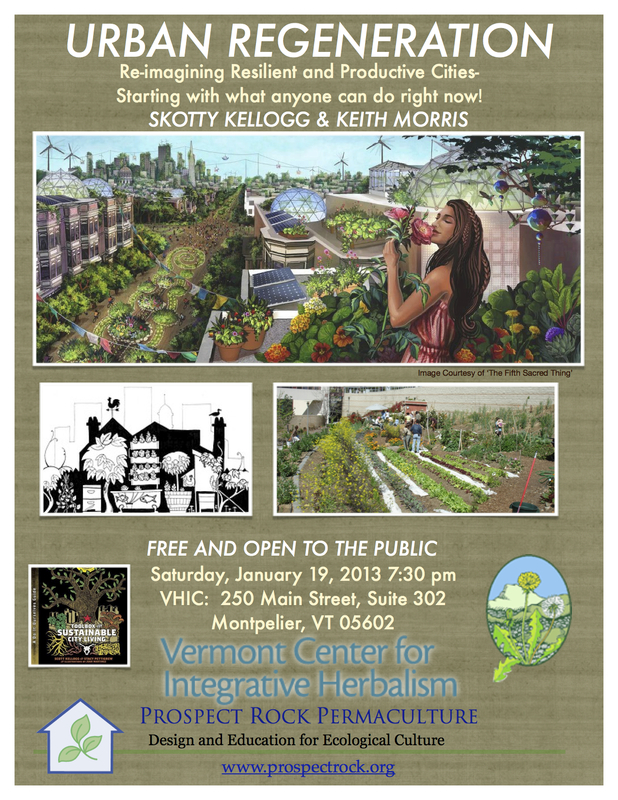 We’ll explore some exciting existing urban farms, “urban homesteads”, and other examples of urban permaculture to better understand the ways we can design and establish our homes and communities as ‘human ecosystems’ that are not only less fuel reliant, but also beautiful, productive, ecologically regenerative, and wholly nourishing. Living: A Do-it-Ourselves Guide (South End Press) and the primary teacher of R.U.S.T. – The Radical Urban Sustainability Training, an intensive weekend workshop in urban ecological survival skills. Currently, Scott is developing a new organization in Albany , New York named the Radix Ecological Sustainability Center . It is planned to be a demonstration of environmental technologies and sustainable micro industries applicable in today’s urban environment. So far, a half acre lot in Albany to house the project has been purchased, and a use variance form the City of Albany to permit the project has been granted. Scott is also a co-founder of Austin, Texas’ Rhizome Collective, (www.rhizomecollective.org), an urban sustainability education project, and worked as the director of its sustainability program from 2000-2009. In 2004, the Rhizome Collective was donated a 10 acre brownfield property in Austin , as well as a $200,000 brownfield cleanup award form the EPA. Scott worked as the site coordinator for the cleanup, and oversaw the removal and recycling of over 15 tons of debris from the site. In 2005-2006, Scott worked with a team of environmental engineers to establish a community based bioremediation program in post-Katrina New Orleans . Scott is an experienced teacher, activist, ecological designer, and father. He presently lives in the Albany Free School Community in Albany , New York . He is currently earning a Masters in Environmental Science from Johns Hopkins University . He has extensive experience designing and building numerous sustainable systems and has taught numerous workshops and multi-part sustainability courses in locations as diverse as Mexico , East Timor, Canada, and inner city America . He has been interviewed in numerous magazines, newspapers, radio and television programs and is regarded as an expert in the field of community based sustainability. Scott has taught at numerous universities in the US , including Virginia Tech, Wesleyan, Evergreen, Washington College , University of New Orleans , and Michigan State University . Keith Morris is a farmer and designer based in northern Vermont who is committed to preserving, advancing, and distributing the collective knowledge of our ecosystems and vibrant agricultural communities to the ends of food justice and right livelihood. He works regularly with urban farms, rooftop gardens, community gardens, and is a Permacorps International ambassador. He has helped design and implement food security and resilience initiatives in the Freetown Christiania; with the Ibo in Biafra , Nigeria ; ‘La Toma’ squat city Santiago , Chile ; the communities displaced by the Newmont Gold Mines in Ghana ; and elsewhere.